The facility will have an immediate and lasting impact on the Academy. First, cadet athletic development will be significantly enhanced as players and coaches have greater flexibility in preparing for competition. Benefits include reduced weather delays, increased practice time, fewer injuries, and better replication of game conditions. Second, this marquee venue will further elevate the reputation of the Academy as a premier institution for amateur athletics. The competition for America’s best student-athletes has never been more intense. The Academy needs every advantage to encourage these individuals to attend. 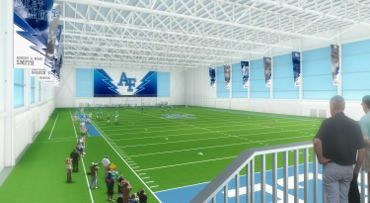 And finally, the facility will host scores of events throughout the year, including intramural championships, summer sports camps, basic cadet training functions, and community amateur athletic events. This visionary effort will serve the needs of all cadets and the Academy for decades to come.